1. One unique passage in the Bible is found in the ancient book of Job. God spoke to Job out of a whirlwind and asked a series of profound questions dealing with both man’s limited knowledge and God’s awesome power. One of these questions is to be found in Job 38:31. What do you see and what does this mean? 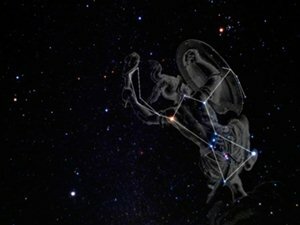 The Pleiades and Orion are still with us and are often visible on a clear night and the modern observation of these through astronomy has given us a fascinating insight into this passage. It is in fact a double-barreled question dealing with two contrasting astronomical phenomena. Let us look briefly at the two objects in question - the cluster of Pleiades commonly called the Seven Sisters, and the stellar grouping called Orion, also known as the Saucepan. "Can you bind the chains of the Pleiades or loose the cords of Orion?" To the naked eye the Pleiades seems to be composed of six or seven bluish stars shyly scintillating in the constellation of Taurus. The telescope, however, reveals that the whole cluster is made up of about 500 stars in a spherical group about 50 light years across and nearly 410 light years away. Photographs reveal some of the component stars veiled in a faint diaphanous blue haze of gas and dust, which beautifully reflects the glory of the stars enrobed in it with their various colors. The Creator’s description of it is extremely apt - it is indeed a ‘sweet cluster’ of stars; a delight to behold. Even to the naked eye there is a winsome attractiveness about the group. However, God's statement to Job also includes an astronomical truth of which Job was probably unaware. 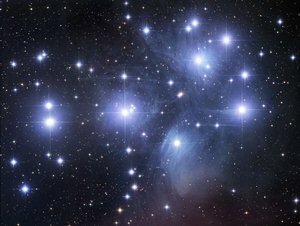 The cluster of the Pleiades is an odd one out as far as star clusters go. Because of the small amounts of dust and gas between the stars in the cluster, it is called a galactic or open cluster, but unlike many such open clusters, it is not breaking up. It is the classic example of a ‘bound’ cluster (1). The energies of motion of the individual stars cannot ever overcome the ‘chains’ of gravity and allow them to move away from the cluster. Nor, indeed, is the cluster expanding, as it has been calculated that it would take 1,000 million years to significantly change the diameter of the cluster (2). This situation is very uncommon as the reverse is usually true of all open or galactic clusters. The constellation of Orion is one of the most outstanding star groupings in the heavens. Photographs of this brilliant association with its giant stars reveal an immense halo of gas and dust in which practically all its stars are immersed. [Part of this nebulosity is visible to the naked eye as the central ‘star’ in the handle of the ‘saucepan’.] The fact that virtually the whole constellation is made up of one massive cluster of stars is in itself unusual. Most constellations are made up of stars merely in line of sight and separated by vast distances. The Orion grouping all lie about 1600 light years away. Despite its size of about 350 light years diameter and despite the vast quantities of gas and dust it contains, the whole system is gravitationally unstable and is steadily expanding outwards (3). The gravitational "bands" holding the constellation together have indeed been loosed, just as God said to Job. Not only that, but even the smaller clusters of stars within the association are fragmenting. On the basis of the stars’ individual motions in one cluster within the Orion Nebula, Dr. Peter Van de Voort has shown that the age of the cluster must be less than 10,000 years (4). This also implies that the whole association must be less than 10,000 years old as both Hoyle (5) and Gamow state that new stars cannot form from clouds of gas and dust unless cloud temperatures are below 5° Absolutes (6). The observed average temperatures range from 100° Absolute and above, and any collapse of the clouds will only increase the temperature which in turn re-expands the cloud. Thus if new stars Astronomical Insights cannot form from clouds of gas and dust and the star clusters that have formed are less than 10,000 years old, it strongly indicates that the whole constellation of Orion is less than 10,000 years old. Therefore, there is far more behind God’s comment to Job that the constellation of Orion is a massive disrupting star cluster than might immediately appear, as it also provides proof for a recent Creation. 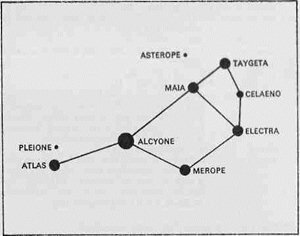 "Can you bind the sweet cluster of Pleiades, or loose the bands of Orion?" Our answer, of course, is the same that Job had to give in all humility - ‘No Lord, such things are beyond men’. But the same humbling question is also a wonderful display of the inspired accuracy of the Word of God. All the more so when we realize that it was given thousands of years before the law of gravity was discovered or the telescope invented. Johannes Kempler (1571-1630). Kempler was an enthusiastic Christian who studied for two years in seminary. He left reluctantly to enter the study and teaching of astronomy. His discoveries made him the founder of physical astronomy.